This July the Society is joining forces with the National Library of Scotland to host a public lecture by Professor Stephen W Brown FSA Scot on William Smellie, a co-founder of the Society of Antiquaries of Scotland, and editor of the first edition of the Encyclopaedia Britannica, as well as the first volume of Archaeologia Scotica (or Transactions of the Society of Antiquaries of Scotland). 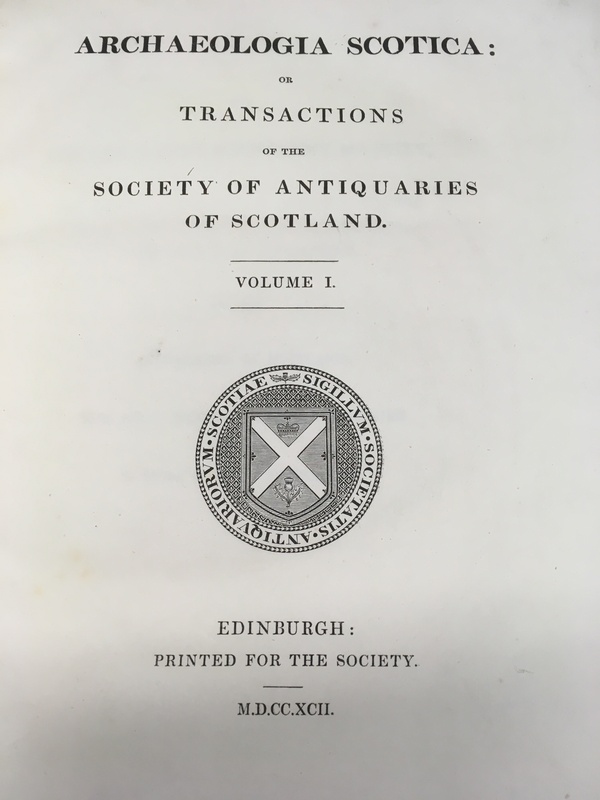 William Smellie introduced the first volume of Archaeologia Scotica with ‘An Historical Account of the Society of the Antiquaries of Scotland’. The article tells the story of the Society’s foundation in 1780, from an initial invitation from the Earl of Buchan, to a royal petition for the creation of a Society ‘for investigating antiquities, as well as natural and civil history in general’. The rest, as they say, is history! The first Transactions, edited by Smellie, were published in 1792. 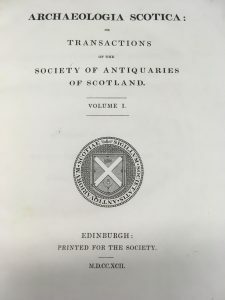 More than two centuries later, the Society is still publishing an annual journal of research into Scotland’s heritage, now named the Proceedings of the Society of Antiquaries of Scotland. In anticipation of this special event, we have collected articles of interest from the first Transactions, and some from the most recent volume of the Proceedings. Tytler, W 1792 ‘Dissertation on the Scottish Music’, Archaeologia Scotica or Transactions of the Society of Antiquaries of Scotland 1: 469-98. Earl of Buchan 1792 ‘An Account of the Island of Icolumkill’, Archaeologia Scotica or Transactions of the Society of Antiquaries of Scotland 1: 234-41. Williams, J 1792 ‘Plan for a Royal Forest of Oak in the Highlands of Scotland’, Archaeologia Scotica or Transactions of the Society of Antiquaries of Scotland 1: 28-38.